Food. Ah the Fuel for our body. The very thoughts of delicious, finger licking favorite comfort food is enough to make the salivary glands go in excessive production stage opening the flood gates in the mouth. And what better place to taste the foods of Delhi than the narrow lanes of Chandni Chowk also known as Delhi 6 for it Pin code number. They say about Switzerland that you can click in any direction and you will get a beautiful picture, I say in Chandni Chowk you can randomly shoot pictures and every frame will get a food pictures. A fruit seller, street vendor with bread pakora basket on his head, a Jalebi shop, a chole wala, it is difficult to click a picture in Chandni Chowk without getting food in your frame. 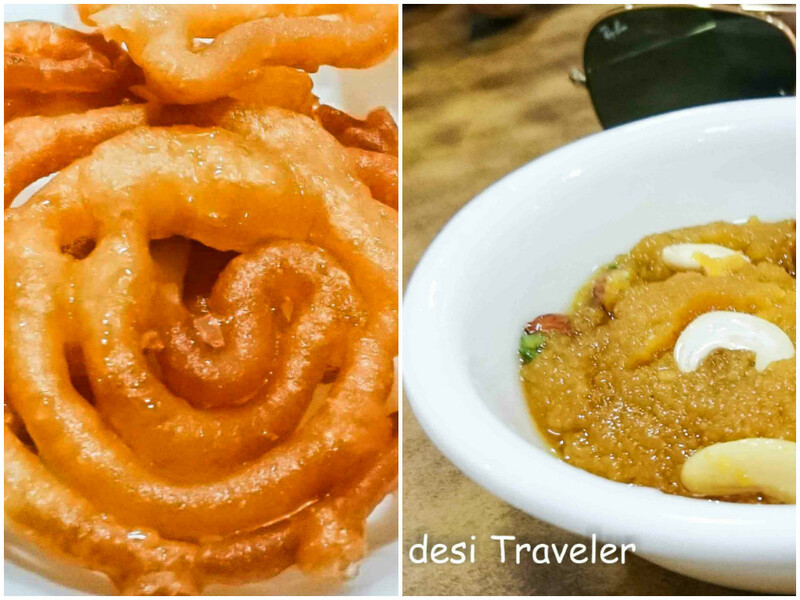 No wonder Chandni Chowk in Old Delhi is the best place to go for a food walk and is considered the food capital of India. 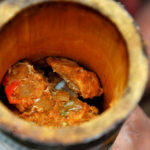 Nothing connects us better than food, the gastronomic glue that binds foodies of the world. The brave of the human species craved spices of India and traveled from Europe and literally launched a thousand ships in search of the source of spices of India. Not all ships reached India, some of them actually landed in the new World. Result? More spices and food, and more migration of the food across the globe during the colonial period. So I was not surprised when Chef Zahie and Chef Gerardo from Mexico were going all OOHS and AAHS like little kids on seeing Chilies, Squashes and corns on pavements of Chandni Chowk, as we entered the Internationally World Famous in Universe Parathe Wali Gali. 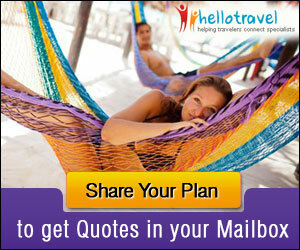 For those who do not follow desi Traveler on Twitter let me give you the background. Chef Zahie and Chef Gerardo are internationally world famous Chefs from Mexico and are TV star chefs. Both of them started their career not in food but as architect and an economist, but their passion for food led them to their calling and today they both are well known Chefs for authentic Mexican Cuisine and they have their own TV Show, YouTube Chanel and a fan following that literally eats out of their hands. The Chefs and yours truly have a common friend Food Diva Elsie Mendez and Chef Zahie and Chef Gerardo invited us to a special exclusive invite only event. I was literally drooling at the thought, but fate had another plans for me. But I was feeling really bad less for the food but more for missing the company of Chef Zahie and Chef Gerardo who were waiting for me all this time. While you’re friendly neighborhood desi Traveler was enjoying the fumes generated by adulterated diesel all around him. But I really wanted to meet the Chefs so invited them for a food walk in Chandni Chowk in Old Delhi. 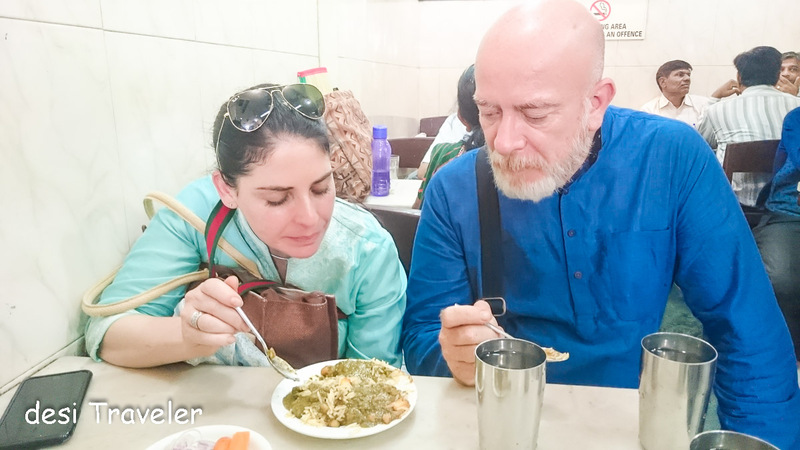 What could be better than a Food Walk in Chandni Chowk , than a Food Walk in Chandni Chowk with two famous Chefs from Mexico who have contributed to books on Mexican Cusine, and love to explore new foods and how food connects us all. Luckily the kind chefs agreed to come for the food walk and we all went to Chandni Chowk in Old Delhi via Delhi Metro Yellow line and had a food tasting tour in Chandni Chowk in the expert guidance of greedy foodie number 1 Shree Tarun Gaur Jee. 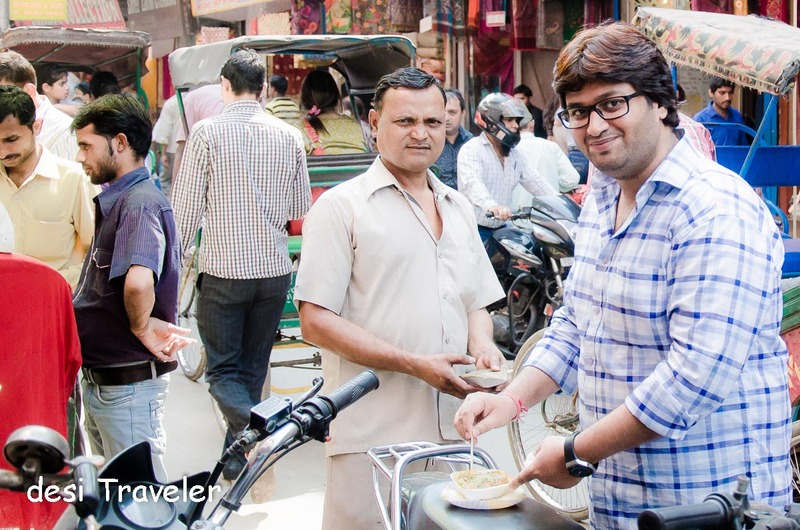 Tarun knows every nook and corner of Old Delhi specially the corners where you find the best street food in Old Delhi. No matter even if sun rays don’t reach those narrow lanes of Chandni Chowk in Old Delhi, but Mr. Gaur has been there and tasted the delicacy and decided if he would like to visit the place again or not. And if Mr. Greedy Foodie really likes the place then he would take you there and make sure you try the best dish that the shop has to offer. The best part of going with Tarun is that he knows which food shop specializes in which food item. So he makes sure that we eat the best of the food and pace ourselves between shops to not miss anything. We focused on the vegetarian street food of Old Delhi in Chandni Chowk and started with a talk about desi food at Natraj Bhalle Wala, but decided to skip them as the Parathe Wali Gali was waiting for us. We visited the most famous of the shops in the Parathe Wali Gali – Pundit Gaya Prasad Shiv Charan. This is a shop where people like Jawahar Lal Nehru, Dr. Rajendra Prasad, Indira Gandhi, many movie stars, Cricket players and people like you and me have jostled for space to ding into the crunchy parathas that are deep fried and not baked in a Tandoor or heated on a Tawa. Kind of Shaken not stirred case. We started with Tomato, Aloo, Mixed and Lemon Paratha, each paratha served with mouth watering side curries and sauces that can be star attraction of a meal on their own. So we had Aloo Mattar Kee Subzi, Banana Chutney made with Jaggery, mint chutney, Aloo cooked in Jeera, with potato skin intact in typical Old Delhi Style, Sitaphal kee Subzi, which we polished with glass of sweet Lassi served in a Kulhad. Needless to say all this was accompanied with a Punjabi Style pickle made from Carrots, Radishes, and green chilies. Now just as side note Chilies are also gift of Mexico to the world along with Corn, Squash some beans and one and only Salma Hayek. (Salma by the way is a friend of Chef Zahie though could easily pass as a cousin). OK, hey guys no Googling for Salma’s pictures, we have enough mouthwatering food pictures coming to make you drool. The breakfast at Parathe Wali Gali was followed by Khurchan and Rabdee, the beauty of Khurchan and Rabdee at Parathe Wali Gali is that they are not good looking at all. As you don’t need any garnishing aka makeup if you are so awesome that you will melt in the mouth. As for what is Khurchan and Rabdee just like Chef Zahie and Salma Hayek they are friends but can pass as cousins. Both are made by heating the milk at slow burning fire for hours and as the milk start condensing one branch of family becomes Rabdee other branch becomes Khurchan. Got it? Well how do you expect to understand the family tree of Rabdee and Khurchan without visiting Old Delhi? As we continued our culinary journey in the little lanes of Chandni Chowk in Old Delhi just following the greedy foodie as if lured by the tune he would sing and we just followed him drooling all the way. Our next stop was the famous Kulcha Wala at Nai Sadak. I remember visiting this particular kiosk even when I was in school though the stall was much smaller in those days. Now there are many similar stalls around the original but you can easily spot the original Kulcha Wala of Nai Sadak as he has maximum number of people waiting for getting their Kulchas. 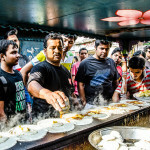 Check this video I clicked of the street food vendor making plates of Mattar to go with Kulchas. 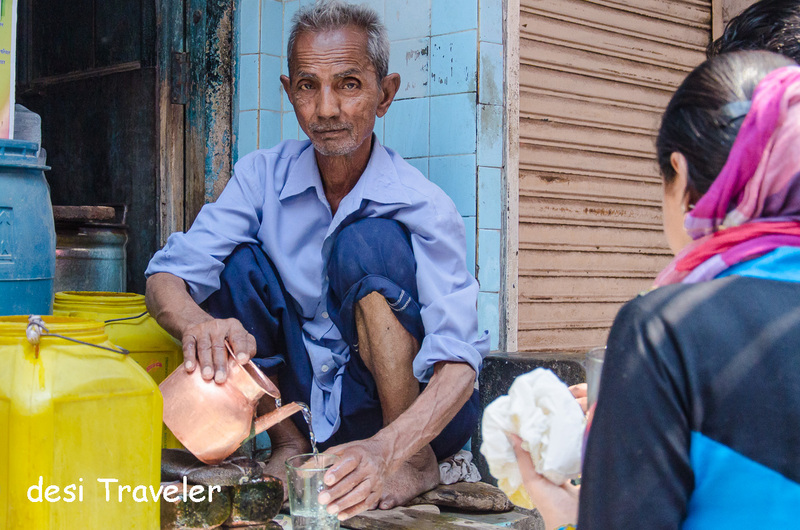 From Kulchas on the street we focused our attention to Shree Ram Dulare whose claim to fame is that he serves cold water to thirsty shoppers, foodies who have chewed on more spicy food than they can handle. He never charges anybody a penny and smiles at those who give him some tips, but he also smiles at those who just thank him and move on without leaving any money. I don’t remember when I first saw him when I was in school or college or on one of the food walk or heritage walk I came to Old Delhi for, but Shree Ram Dulare has been exactly like this as if an animated movie is being replayed on TV every single day. Shree Ram Dulare still has that decades old, yet refreshingly shy but warm smile, same cold water, same benevolence towards those who stop and request for a glass of water on his stall. Respect. They no longer make people like Shree Ram Dulare anymore, may he continue to serve water to thirsty foodies and shopaholics in Old Delhi for decades to come. Soon we walked towards the Gole Hatti a shop that has a very Punjabi menu as apparent from the name Gole means round and Hatti in Punjabi is a Shop. 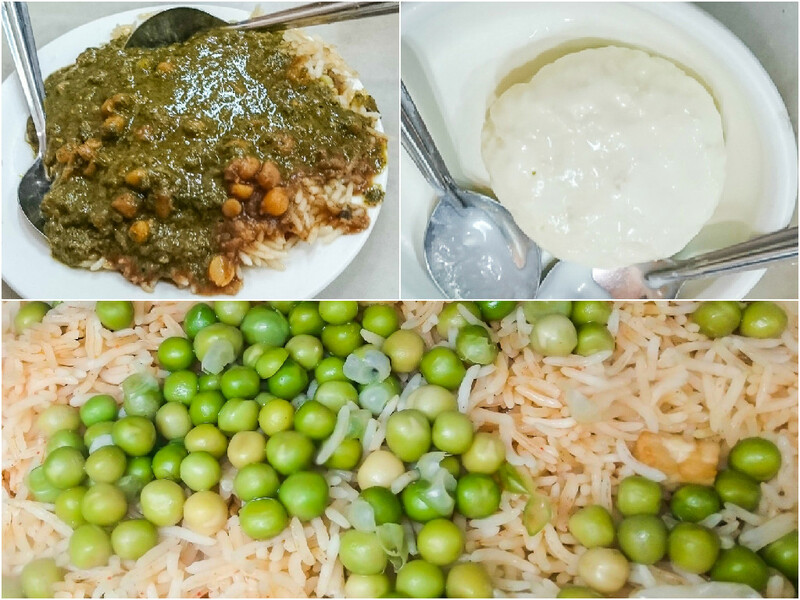 We stop there for a plate of a Chole Palak with Rice or Rice with spinach and mattar . The two chefs take a spoonful of the rice and stop eating, I wonder if they do not like it. 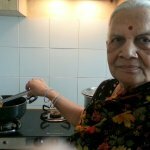 ( check the second picture from top in this post ) After a few seconds of suspense they smile and say “Wow, we love it” Both me and Tarun give a sigh of relief and as usual the chefs want to know all the spices used in making of the Spinach curry. 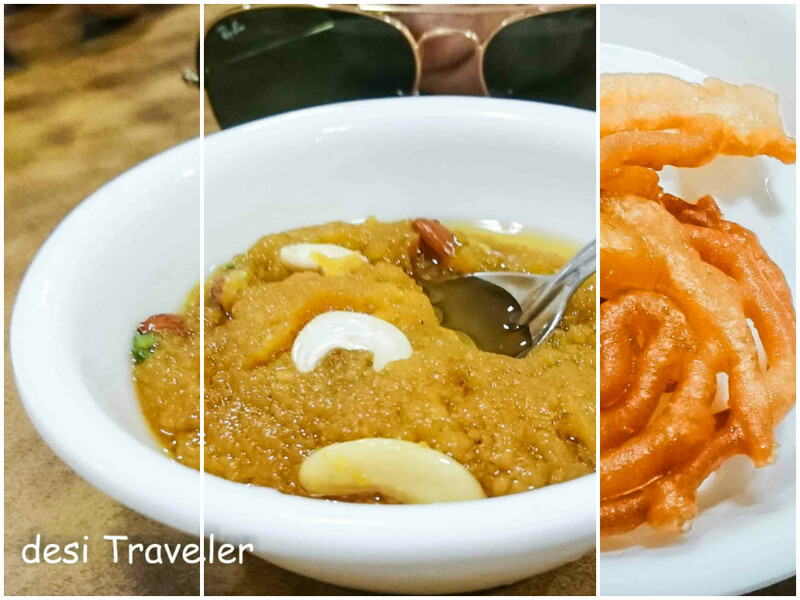 But our desire for deserts was still going strong so we walked in Shiv Mishtan Bhandar and polished plates of Jalebi and Moon Daal Halwa. So the petition of tummy won over desire of the tongue, and we decided to walk towards the Chandni Chowk Metro Station. But not before we all had a hot cup of desi Masala Chai at Hemchand Ladli Prashad, milk sellers in Kucha Ghasiram. As we were walking back to metro I rememebered that Chef Gerardo had requested for a head scarf for his head as it was too hot, but we have all forgotten about the same. 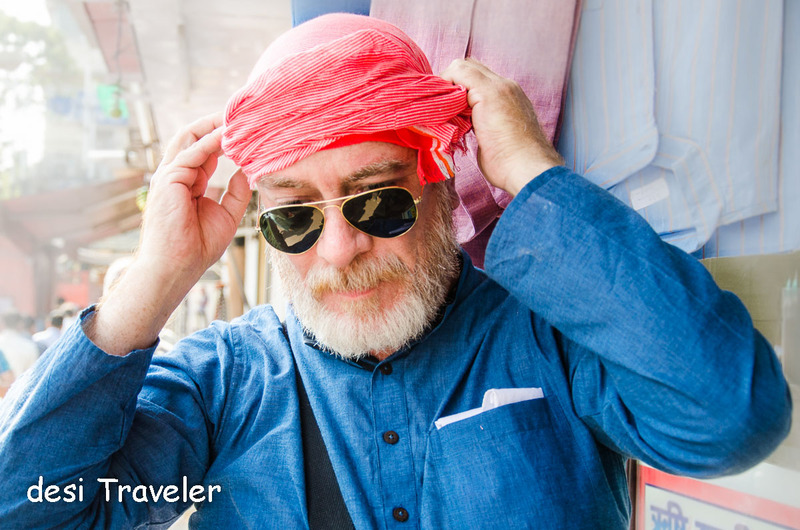 So after hours of walking in streets of Chandni Chowk in hot sun just before we entered the Metro Chef Gerardo got his head Scarf. 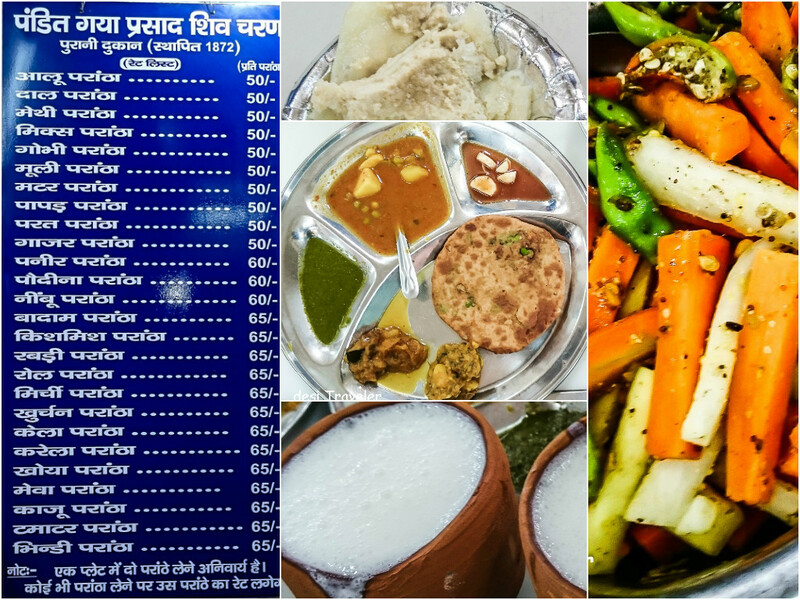 With this dear reader I close this post, we tried may be 5% of delicacies and street food available in Old Delhi and for sure will be back as we missed one of the best kept secret of Chandni Chowk the Nagori with Subzi as it is a breakfast dish. How to reach Chandni Chowk: Your most economical and environmental friendly way to reach Chandni Chowk is Delhi Metro Yellow line. Those coming from Blue line can change at Rajiv Chowk Metro Station. If you reach around 7 am in the morning you will get some special dishes that are served only during breakfast. Wanna join we go their next time ? If you have any recommendations please mention the same in the comments. I am sure you will enjoy visit to Chandni Chowk Maria.. Spoiler Alert!!!! This is all foodalicious here and I’m loving it!!! This would have been a fare parade rather than a food parade. You photography and all those little captions (especially the one about Aloo chapatti) is a real tempt I envisaged while reading. Thank you for an appetizing blog!! Thanks a lot Adarsh….glad you liked the same..
Oh wow! This is like the king of all food posts. So inviting Prasad. I don’t know who would not want to go do a food tour of Chandini Chowk, now Thank you for taking me on this virtual tour. Btw this post is so full of life; I really enjoyed reading it. And if you ask for paper napkins to wipe off the excess ghee on the paranthas, you will be treated as an alien from Mars. I have passed by Chandni Chowk numerous times, but never got to get down the bus to explore the place…looks like i would have to do that being a big time foodie. Aaaaaaaaaaah, you’ve set me off on such a major Chandni Chowk food craving now! 🙁 I’ve loved every one of my food jaunts to the place, and the sheer number of people who would do that even in blistering Delhi summers is a testament to how good all the food items are. 🙂 I also love Nagori Halwa, which you’ve mentioned as that rare breakfast item only the early birds get to peck on. 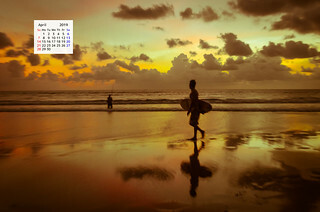 Beautiful pics, and suitably tinging to my currently deprived taste buds! And it’s so awesome that you got an opportunity to partake of these heavenly delights with such acclaimed chefs! This is mouth watering. Great pics. I particularly liked the rice and peas. I have to do this walk when I am in Delhi. I have been to paranthe wali gali many times, that small run down place is hot favourite for parathas. They serve the best mouth watering stuff. Thanks for sharing this post on Chandni chowk. It’s the hub for shoppers and food lovers. 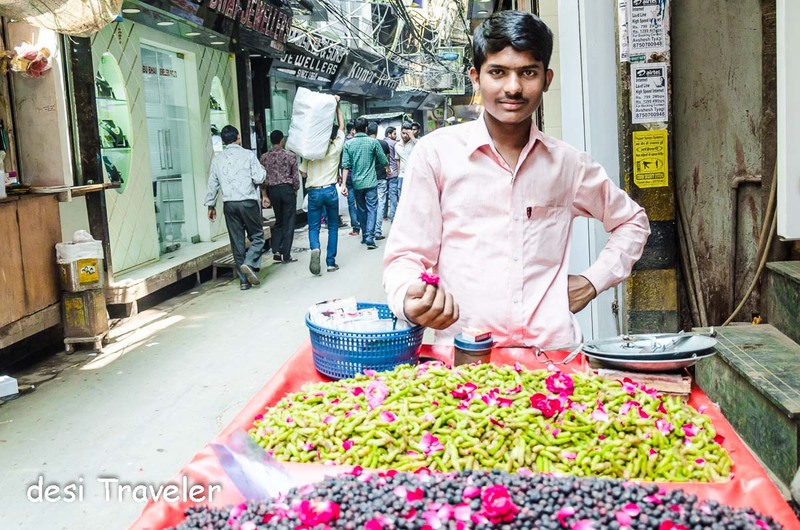 Absolutely, nothing comes close to Chandni Chowk, Parathe wali gali and the surroundings for great food and great shopping at wholesale prices…. Hmm the trick is to focus on food and forget everything else.Anyways now things are better and more clean compared to a few years back..